Home / News / Video / OH NO! Dad found something venomous and deadly inside his son's shoe! OH NO! 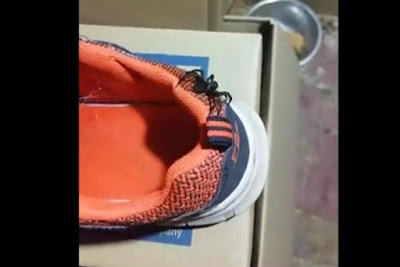 Dad found something venomous and deadly inside his son's shoe! The reason why you should always check on your shoes before wearing it! If this dad didn't look on his kid's shoe the consequence could be the kid's life! Watch what happened! Have you ever left your running shoes or rubber shoes outside your house? Did you check on it first before putting them on? Here's a reason why you should check on your shoes whenever you left it outside the house specially when you leave in Australia. 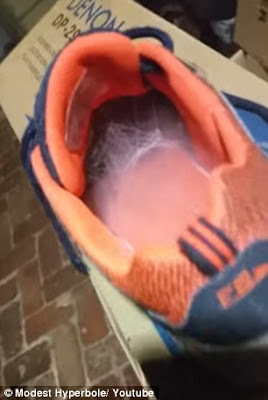 An Australian dad shares his experience about catching a deadly spider inside his son's training shoes after it was left outside overnight. The shoes has cobwebs inside while the deadly Australian funnel web was still hidden inside. After checking on the shoe, he proceeds on spraying the shoes with a insect spray several times and looked at it of the spider inside had made any move. But it seems like the spider doesn't want to evacuate the shoe, so he decided to use a skewer to poke the spider inside. Within just second, the black funnel web appears from the shoes and crawls around it. The man concluded the video with a message, "Welcome to Australia"
The video clip was posted on YouTube by username Modest Hyperbole, it quickly went viral because of the reminder to check on your shoes first before putting them on again when you accidentally left it outside the house.